Well locations can be friends too can't they? This segment of our trip is Laughlin. We first discovered Laughlin several years ago when we started our April sojourns to the south. Although we love Vegas for a night or two, we found it wasn't a long term stop. A friend suggested we try Laughlin, and it was a perfect fit. Approximately one and a half hours south of Vegas, Laughlin has 11 casinos. Situated on the Colorado River, the casinos are connected by a river walk. It is definitely a smaller version of Vegas, and has even more seniors than it's big north sister. 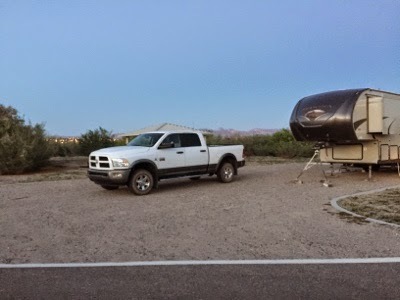 But it is also within easy distance of Lake Havasu City, Kingman and Route 66, and if you like driving like we do, close enough to Mexico for a day trip. We have found a new campground here as well. Big Bend of the Colorado State Recreation Area is 24 site fully serviced campground on the Needles Highway. It is in the town limits of Laughlin, so very accessible to the amenities, but hidden away off the roads and streets. With no street lights it offers the feel of being out in the woods without being so. I can honestly say we have never found campsites this large. This picture may not show it well, but there is no doubt 3 rigs could fit in side by side! Our time here has been so pleasant. We have passed the time relaxing, reading, shopping and walking the casino river walk every night. Of course that allows us to drop our regular $10 in the machines, one penny at a time. Don actually plays for a nickel! 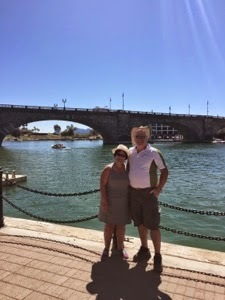 We travelled to Lake Havasu one day for a walk on the beach and lunch under the bridge. It was as peaceful as ever, keeping in mind that it is the spring break hot spot of the area. There is a 5 mile beach Boardwalk and that makes for a great walk! 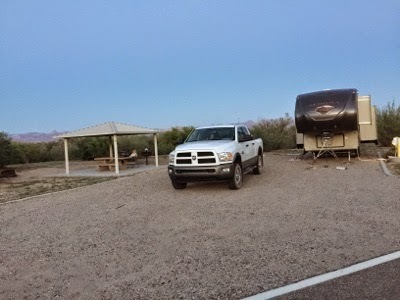 Pat and Walter spend the winter in Yuma. We have stopped at their winter home in the past but we aren't going that way this winter. We phoned them and on Saturday we met half way in Parker for an afternoon of visiting and an early dinner. It was a great visit as when we are both in Alberta we seem to busy to make the 3 hour drive. So yes it was the Parkers in Parker! Sunday was another day of rest, and then moving on. 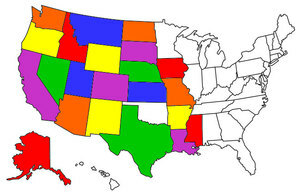 We're headed for some new territory in eastern Arizona and then Utah. I will let you know where we actually end up and what we see. There's no sense telling you in case the truck takes a different route. I just want to say a quick hi to all our readers out there, but a special one to a new follower, our grandson Blake!